I left my session to the evening today as I went over to Guildford college to train with a guy I’ve been coaching. Nice small gym, only model C’s, but in pretty good condition. Now this may look like a good controlled set, but the final rep was a little different to the look of it. 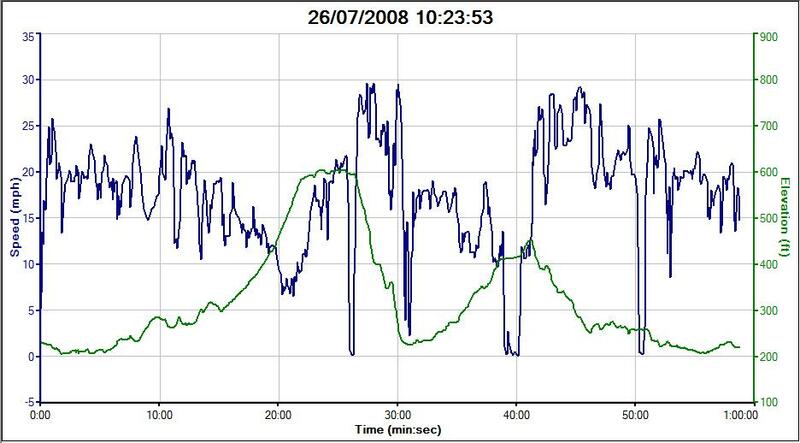 I went off faster and was sitting just under 1:39 average when at 600m to go a gym instructor decided to close off the curtains around one corner of the gym (right next to the ergs) and left one curtain to the side of me, that stuck itself straight to the side of the fan. The drag dropped from 130 to about 20 with no air being able to get into the side, and my split dropped from 1:38 to 1:57 with nothing to pull against. I shouted to her to move it, but by then my average split dropped from 1:38.8 to 1:40.0 – I was about to push hard for the end too, very annoying! I don’t think she even understood what my problem was until she tried to peel the curtain off the side of the erg, to find it was vacuum packed to it! Not much more to say about that, solid enough session, but I don’t like model C handles. Tomorrow is a steady distance row, then an “interesting” session on Friday… Friday’s session is one I’ve done before a few times, and if you want to push it to the limit it can be a truely horrible session. 20mins on rowpro, where I unfortunately lost connection to rowpro 3mins from the end. I decided before this row that if I keep targetting 1:39.9 pace on these sessions then that is all I can hope for in the 5k test in 5 weeks time. Therefore there is a need to push these sessions to this sort of pace to give me a good chance of a pb in the 5k – it will get hard as the next few weeks progress to maintain this level of pace on these sessions, however. A few new additions to PPC over the past month, so it will be interesting to see how I can help them move towards their goals over the coming weeks and months. For those of you with access to the members area of the blog (ie those who I coach) I will update the list on there so you know who is in the team now. I’m still no super downhill road cyclist, hitting only 30.1mph maximum speed, but it’s still a step in the right direction, and it felt comfortable and safe this time. After gaining confidence in the bike coming down the hill I just didn’t fancy riding back up it again to try coming down a little faster! It has been a little over a week since I last updated the blog. Last Friday was the beginning of the first “Tour De Harry” cycling tour, taking in the north York moors over a 3 day weekend. A 280mile drive via Oxford got us up there to meet the group of 8 cyclists. Not the most “normal” looking group of cyclists you ever saw ranging in height from 5’8 to 6’8, in weight from 70kg to 110kg, and in age from 30 to 60. Friday evening we did a 20mile warm up / recce ride around the area we were staying, with the big ride on the Saturday. 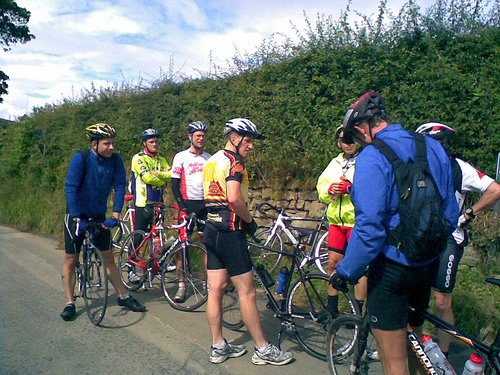 The Saturday ride was interupted by a few bike issues – 4 punctures and 1 damage wheel / loss of spokes. Two of us made a breakaway coming up to the lunch stop and that was when I had my one puncture, 2miles out from the village. Unfortunately I wasn’t the most well equipped of inexperienced cyclists, so didn’t carry any spare inner tubes, so this meant a 2mile walk with the bike to the next village, which luckily had a bike shop. The other lucky part here was that I was the only one without proper cycling shoes, making the walk a lot easier. As you can see, some very steep up and down hills. The up hills I enjoyed, but the downhills I didn’t. If I went above 30mph I felt a bad wobble from the front wheel, so kept the speed below that the whole day. I put this down to my lack of experience on a road bike, and perhaps something to do with my hand position on the bars. I have since found out that my front wheel wasn’t quite round, as I took it in to the bike shop yesterday for them to true it for me, so a ride later this morning will show me if that has been the problem with high speed descending ever since I first got the bike. An evening in the pub after the ride ensured that there was no thought of another long ride on the Sunday, luckily, so after breakfast we set off for the 280mile journey back south. Then from Monday to Wednesday I had a work trip up to Blackpool, another 500miles of driving, and another couple of missed erg sessions. I did find out on Tuesday when I went in search of the hotel gym that it did have 4 model C concept2 ergs, so I got in a quick 10k to break the dry spell. This week has also been the first week of phase 3 of Pete Plan 2008, aiming at a 5k test now in 5 weeks time. The first session of the week was to be 12 x 500m / 1min rest – the session I did last week. Yesterday’s session was a 6k with the first and last 2k fast, and the middle 2k steady. With no trips away planned during the rest of Phase 3 of PP08 the erg sessions should be uninterupted, and so I should be back on form within a week or so, and I should be able to push on towards a pb for the end of phase test. But I pity the fool who ergs without a plan. I didn’t go to the gym at lunchtime. I’ve felt tired all week, and I had a headache all day today. I had no intention of getting on the erg this evening, but I decided to look on rowpro and see if there was anything to take my fancy. A 10k in 6mins time? That’s not long to get ready. The erg was in the living room though, so I connected the laptop, put some shorts on, registered, and set off with no plan what so ever, no warm up, and that’s not a good combination. That’ll help me be nice and rested for the Tour De ‘arry starting tomorrow. I’m a big believer in psychology and positive mental attitude when training, and especially when racing. People have often said to me that I don’t look like I’m trying too hard in racing, and sometimes in training too. When I race I find that if I give the outward impression that the effort is not too hard it does two things – it helps me believe that it’s not too hard, and it makes other people (the opposition) think that you have more to give. Also screwing up your face and making stupid noises just uses energy you don’t need to use. Most of the people who do it in the gym do it for show “look at me, I’m working out really hard, how tough am I?” – no, you’re a jackass, and it just makes me think “you have to try that hard to get that mediocre performance?”. I should know, I’ve caught myself doing it in the past. 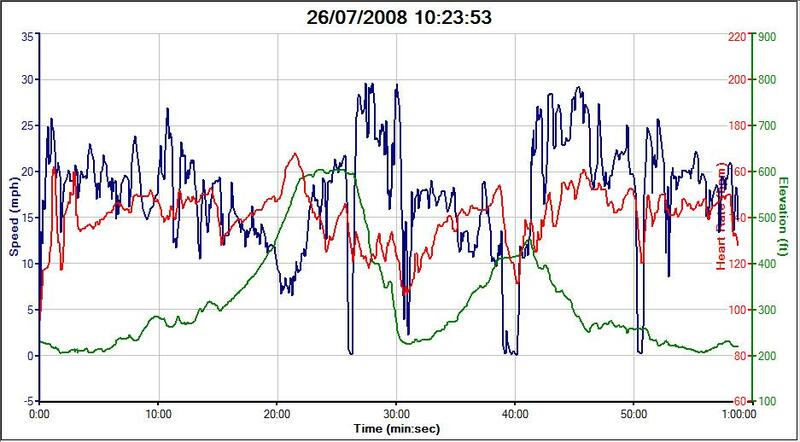 Talking of things you do in training, and showing off, what is it with the obsession with low rate rowing, and getting huge power per stroke? I understand the reasoning behind doing long distance work at low rates, but doing things like CTC challenges at (very) low rates, what’s that all about? And why are people impressed by it? Especially when they try to make out it is somehow restricted, implying it is somehow less effort, so doesn’t impact their training programme. If people were honest and said “I don’t have the fitness to do myself justice at higher rate, so I did the 8 x 500m at r24” that would be fine, but to imply that you could do it significantly faster by increasing the rate belittles the performances of those faster than you, unless you deliver on that prediction later in the month. Really my frustation comes from the belief that people train the wrong way to utilise their talents to produce the best 2k performance. Afterall, that is what the majority of erg racers are interested in, producing the fastest 2k possible come race day. Nothing else matter, noone cares who stroke rate you did it at, whether your stroke looks good, just the final time. As I have mentioned previously, we are currently on a two week break between phases 2 and 3 of Pete Plan 2008. Phase 2 concluded with the 10k test on 5th July, then last Saturday we had the Evesham golden mile race, and next weekend is the bigger brother of the Tour De France, the Tour D ‘arry. More about that later. Firstly a training update for the past few days. After arriving back from Evesham on Sunday with the after effects of the “socialising” post race, and a bit of sleep in a tent, a 30min bike ride out in the fresh air was the best thing to do. The Tour next weekend will be a strange event. We are arriving in the north York moors on Friday afternoon for a short pre-dinner ride. Then on Saturday is the main event, about a 90mile trip culminating in the “Rosedale Chimney” – apparently the toughest hill in britain to ride up. About a 35% gradient and about 1km in length, bets are being taken as to who can make it up without putting a foot down. There are 8 people going on the tour ranging in size from about 68 to 108kg, from 5’8 to 6’8 tall, from 30 to 57 years old, and from regular 100mile time trialist to almost non cyclists like me. However, everyone going is a top athlete in their own right (albeit some in sports not too similar to cycling), so the mental attitude will be there, and it should be a great weekend. Will any of us make it for the further planned ride on the Sunday morning? Who knows. No sooner than the tour is complete and it is time to begin phase 3 of Pete Plan 2008. With 2 new members of the team we are up to 11 people beginning PP08 (with perhaps a couple more merging to join us from similar Pete Plan Coaching programmes). This phase is aimed at a 5k test around the weekend of 30th August. 6 weeks and then we can attempt my favorite distance, but perhaps one of my strongest pbs as it was done in competition in a very close race. If any race happen for the PP08 group during this phase expect their performances to be a level higher than so far this year as this training will give a big jump in fitness and strength endurance. Whatever we achieve over the shorter distances in the next 6 weeks will only be a taster of things to come as we move into the racing season and onto proper speed work however. What this space for our progress. As you will know from reading my blog, the Evesham Golden mile race has come at the end of our distance training phases on PP08. As such I’ve just done two “speed sessions” this past week, the 8 x 500m and the 20 x 100m. The three other PP08 ergers racing at Evesham were in the same boat, so to speak, as Jef, Darin and Emma have been doing the same sessions as me. Three other Pete Planners also raced at Evesham – Rob, Iain and Mike, who had done varying amounts of specific race preparation, but none of whom were specifically targetting this race to be in peak racing form. That said every one of them rowed very good races – I will leave it to them to tell the story of their races in their own blogs though. I was undecided up until about an hour before the race how to pace it. As I knew a pb wouldn’t be on I thought I would try a negative split race strategy. The plan was to start off comfortably at 1:35’s, and then gradually speed up with a sprint at the end. Take a look at the replay about and you will see that is exactly what I did. I felt great throughout the race – strong, in control, and with a good bit in hand. When I went for the sprint with 200m to go I hit 1:24’s, and only faded back to 1:29 on the finish line. I could have gone faster, but I don’t care. A 1:33.5 average split for a mile at this point in my training is a great sign for the coming racing season when I’ve done another 13weeks or so of training. 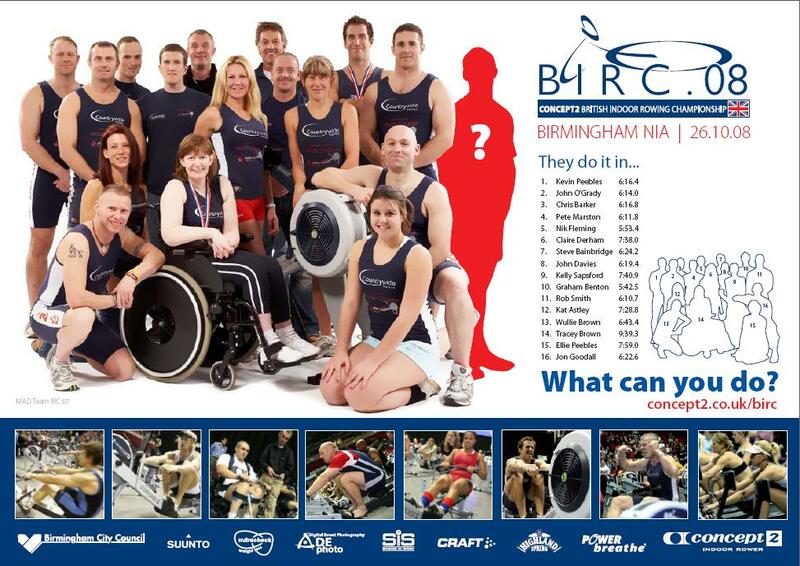 If you are reading this and haven’t been to an indoor rowing race before you probably don’t understand why we do it. If you get the chance, go to one, especially one like this where people stay around to socialise afterwards, it’s great. A brilliant group of people compete in this sport in the UK, and it is always great meeting new people racing for their first time. We didn’t get too much sleep in our tents, so the 2hour drive home this morning was pretty tiring, but it was all worth it for a great weekend. The PP08 group have a free week this week before we begin our 5k phase a week tomorrow. This is really to fit in with my plans as I’m away on a cycling weekend next weekend in the north York moors with a talented group of cycling ergers, or really some of them are erging cyclists, as cycling is their main sport. I will be one of the slower riders, and it will be tough going the length of rides we’re doing, but I’m looking forward to it. My plans for this week? I will do a hard pieces perhaps on Tuesday and Thursday – maybe pb attempts at some distance. Tomorrow I’m going to the Farnborough Airshow, and Friday I will be travelling north for the cycling weekend. Well done to the PPers in the racing yesterday. We had the fastest woman of the day, I think I was third fastest man, and I think we took home 3 golds a silver and a bronze. After completing this session today I have actually changed my advice on the page above, more about that after the session details though. The session today was 20 x 100m / 80seconds rest. Only 2k of actual work distance, but all done pretty much maximally. I also wrote down the splits between reps as the PM3 rounds them in the memory, as it just derives the split time from the final time, meaning you just get the closest 0.5sec for the split times. You will find that if done properly, at high rate and maximal power, this workout will hit your hamstrings and glutes hard. I’ve often commented to people before who like to sit on towels while they row that I don’t believe the discomfort they feel in their glutes has much to do with sitting on a hard seat, but is primarily a result of muscle fatigue. This workout will demonstrate that very well. After only 2k of rowing your glutes will feel like you have just rowed a marathon! After this session “normal” training paces (at normal training drag) will feel very light. The idea is that this then has a knock on effect on your 2k pace also feeling nicely in the “comfort zone”. Put these two HIIT sessions into your training routine in the final 4 to 6 weeks before a race, either once a week, or the two different sessions in each week, and you will be amazed at the effect on your 2k performance, particularly your sprint finishing ability. Any questions or comments, please reply! With a 1 mile (1609m) race this coming weekend a couple of faster sessions are the order of the week to be able to row at any sort of pace in the race on Saturday.